Next MacBook Air to Adopt Faster, More Power Efficient SSD? Current SSD device Blade X-gale supporting SATA 2.6 will be abolished and new 19nm flash memory will be packaged into smaller chip and will be soldered on base circuit directly. The move would be a rapid departure by Apple from the current SSD stick format that was just introduced in last year's MacBook Air. Instead of a replaceable part, the new Flash chips would be soldered directly onto the MacBook Air's motherboard. 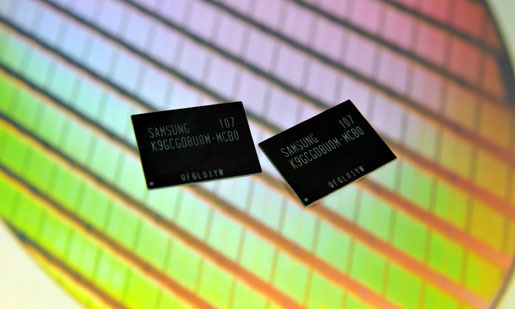 The new format supports speeds of 400Mb/s and in conjunction with a new ONFI 3.0 standard will allow future controllers to run faster or similar performance to today's SSDs with "half the number of channels, providing both a cost and space savings". Samsung also touted another major feature of this new technology last year, claiming that a low-power mode could extend a notebook's battery life for an hour or more. The resulting power throttling capability enables the drive’s high-performance levels without any increase in power consumption over a 40nm-class 16Gb NAND-based 256GB SSD. The controller also analyzes frequency of use and preferences of the user to automatically activate a low-power mode that can extend a notebook’s battery life for an hour or more. Given the market positioning of the MacBook Air, the potential battery improvements and cost savings may be driving Apple's adoption of this technology more than the performance advantages. The sceptical in me says this is nothing to do with speed, but rather with limiting 3rd party SSD upgrades. Custom hard-drive firmware on iMacs, now soldered SSD... Apple machines are fast becoming severely locked down, and turning computers into disposable units. I love Apple but am getting royally pissed off with this artificial locking down, especially if I can't even reuse components like a screen. SSD soldered onto the motherboard hmm. You trash your ssd with writes and that means that you also trashed your motherboard. Nice. Soldered ram maybe, soldered ssd nop. I'm not sure why people are complaining about Apple locking down the MBA. In order for laptops like MBA to get thinner, everything has to be more integrated (or locked down) and the option to upgrade has to be eliminated in order to do this. Apple isn't locking down the bigger laptops that can support upgradability, they're doing this for the ultra-thin laptops. The more they can solider onto the laptop, the more space they can remove. You are not paying $1K for the option to upgrade, you're paying $1K for the best integrated laptop with the smallest weight and footprint. Do we really want to move laptops to a point where they are completely unexpandable? Simple math... better battery life will benefit 100% of users... upgradeable SSD will benefit .001% of users. Here's something to consider. Macbooks have an insanely high resell value. Rather than complaining about computers being locked down and unable to upgrade, buy a macbook and use it for 2-3 years and then SELL it rather than upgrading. Then buy a newer generation system. You'll be getting a much faster system anyway. Case and point. I had a 2000 dollar macbook pro from 2009 and I just sold that thing for 1300 on ebay. 3 years and a loss of only 700 dollars is almost a steal. Put in a couple hundred dollars and I'm picking up a baseline 2011 macbook pro 15. It's 400Mbits/s, not bytes. The actual speed depends on the controller too. No. There are SSDs which are capable of over 600 Megabytes per second for read speed, and 700 for write, so this is well within range for an affordable SSD. Instead of a replaceable part, the new Flash chips would be soldered directly onto the MacBook Air's motherboard. This will undoubtedly usher in an exciting new paradigm in planned obsolescence during the forthcoming post routine maintenance era! I think they just need to hurry up and release the 2011 models already! That said, sticking the SSD onto the logic board is an interesting move. Personally, I'd accept it to get the battery gains, but then I can imagine some people being in uproar about the fact they can't upgrade in the future - however when you buy the MBA you can't touch the RAM, so the SSD is just a similar component. For portability, speed and battery life I'd happily sacrifice being able to rip a laptop apart. If we're honest, how many MBA owners really change the SSD etc? 1%? Less than that? You think this is for better performance and battery life? WRONG! Apple wants more control of their computers and would love to put the 3rd party blade SSD makers out of business. The paranoia around here is just plain funny nowadays.